As a nonslaveholding, hard-working yeoman farmer, Washington Duke (1820-1905) typified the great majority of white, male North Carolinians-indeed, white male southerners in general-before the Civil War. In the early 1850s he built a modest frame house on his farm, which was located in what was then Orange County about three miles outside of what would soon become Durham's Station on the new North Carolina Railroad. After his first wife died, Duke married Artelia Roney in 1852. A daughter, Mary Elizabeth, was born to the couple in 1853. A son, Benjamin Newton, followed in 1855, and another son, James Buchanan, was born in 1856. Benjamin's and James's subsequent business successes led to the creation of such important North Carolina institutions as the American Tobacco Company, Duke University, and the Duke Power Company. Although Washington Duke, like many other North Carolinians, opposed secession, the Confederate draft reached him in 1864 and he served until the end of the war. Returning penniless to his children and farm, he began, with the help of his family, the home manufacture of smoking tobacco, which he carried by wagon to peddle in the more populous eastern part of the state. In 1874, inspired in part by the earlier move of his surviving son by his first wife, Brodie L. Duke, Washington Duke sold the homeplace and moved with his family to the new town of Durham, which was growing rapidly, along with the tobacco and textile industries. In the early 1930s Washington Duke's granddaughter, Mary Duke Biddle, purchased the old homestead and gave it to Duke University. 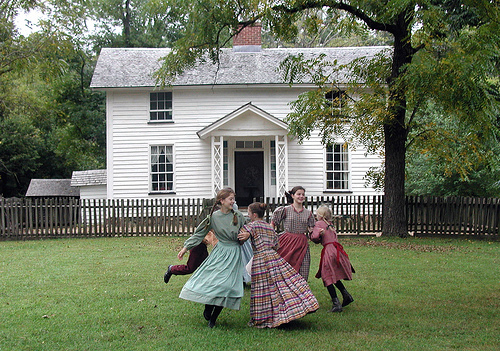 In 1974 the university, in turn, gave the house and 37 surrounding acres to the state, which added Duke Homestead to its list of North Carolina State Historic Sites. In 1977 a tobacco history museum opened near the original farmhouse and early "factories." Both the museum and the Duke Homestead are open to the public without charge. The Duke Homestead Guidebook (1978). Robert F. Durden, The Dukes of Durham, 1865-1902 (1975). Duke Homestead. Image courtesy of NC Culture. Available from http://www.flickr.com/photos/ncculture/3117779001/ (accessed June 14, 2012).